12.5" RCOS @ ~f/9 (2880 mm fl) 1.28 arcsec / pixel. The Zoomify image scale is 1.28 to 3.33 arcsec / pixel. 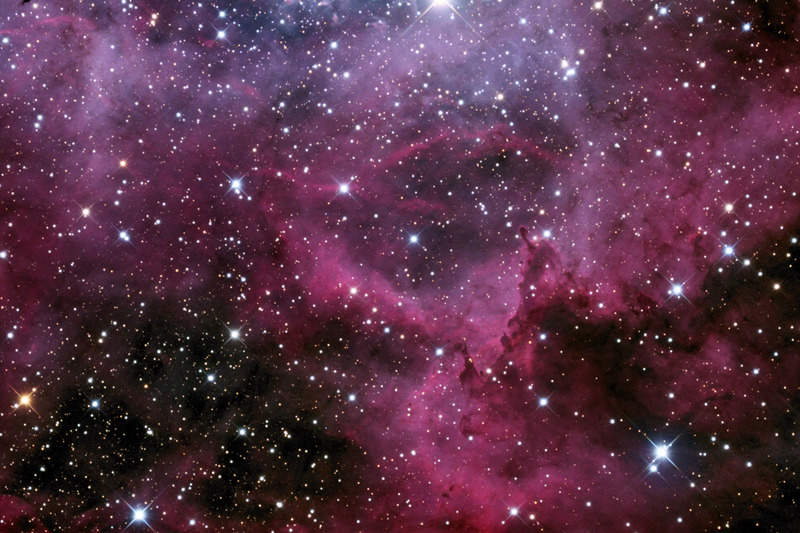 This is a close up view of an interesting area inside the Rosette Nebula. NGC 2237-9 are a large, circular hydrogen region located near one end of a giant molecular cloud in the Monoceros region of the Milky Way Galaxy. The open cluster, NGC 2244, is closely associated with the nebulosity, the stars having been formed from the nebula's matter. The Nebula is about 100 light-years across and is about 5000 light-years away.